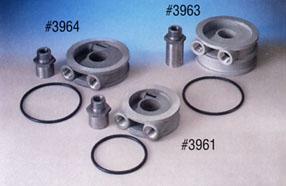 A Sandwich adapter permits the installation of an engine oil cooler without relocating the oil filter. It installs between the oil filter and the filter land on the engine block, providing a pressurized source of oil for the engine oil cooler. Flex-a-lite’s new proprietary design in light weight, matte finish with machined mating surfaces. Covers all major applications. NOTE: A Sandwich adapter increases the distance the oil filter sticks out from the block. Check beforehand for adequate clearances. Shorter filters are made to fit most applications.